These Outter Tie-Rod Ends are compatible with both our Inner Tie-Rods and the OEM Tie Rods. 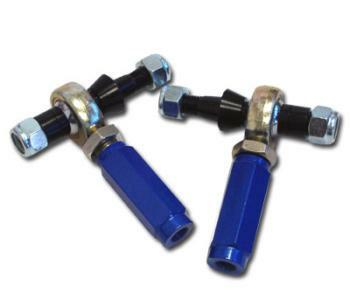 They replace the OEM Tie Rod Ends with a high strength aluminum alloy Tie Rod End that can be used to fine tune Toe-Adjustments and by proper use of spacer combinations can be set to proper suspension geometry to achieve the most steering angle possible which is crucial for drifting and other motorsports. Will fit OEM Tie Rods and aftermarket Tie Rods with the same thread pitch and size. Ability to fine tune your Toe settings. Ability to achieve proper suspension geometry for the greatest possible steering angle.